The Carers’ Resource Young Adult Carer project aims to empower, educate and celebrate young adult carers (YACs) and members are now approaching local businesses to gain further recognition within the town. For 16 to 25-year-olds, the project involves a range of activities, including CV writing, help to find work, education or training, and support in overcoming mental health issues, as well as social events such as ping pong and pampering. Hettie Flynn, YAC worker at Carers’ Resource, in North Park Road, Harrogate, said within the first six months 30 YACs successfully took part in sessions. They have also been given one-to-one mentoring to help boost their confidence and combat isolation and joined in with group activity. 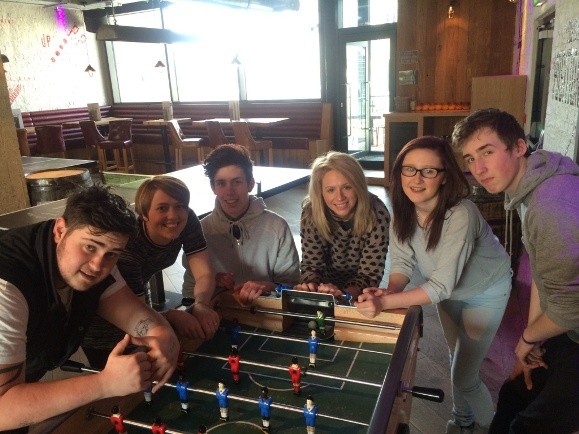 Hettie said: “The impact the project has had on young people’s lives in a short period of time has been phenomenal. They helped negotiate a 25 per cent off deal for carers under 25 at Rossett Sports Centre in Harrogate, and are also working towards setting up a YAC support group at Harrogate College. YAC Sophie Wilson, 22, said: “The help and encouragement I’ve had from Hettie has been ace, she’s amazing. “I was so used to being a carer that I thought it was just normal and she has helped me realise that I can think of myself and put my own needs first. “It’s wonderful to know that there is support out there and to also know that I’m not on my own. “I can be myself and I don’t have to explain everything to other young adult carers as they understand where I’m coming from. Carers’ Resource director Anne Smyth said: “There is increasing interest nationally in supporting young adult carers and, importantly, in preventing them from caring inappropriately. “We know much more about young carers than about young adult carers – they form a discrete but growing group who fit neither into younger children’s services nor into full adult care and support. The charity, which supports about 12,000 carers across Harrogate and Ripon, Bradford and Skipton, is now hoping to extend the YAC service into Skipton and Craven. “Some parts of these areas are rural and isolation and loneliness can be an issue but we hope that with the use of Skype and Facebook we will be able to help YACs overcome these challenges,” said Hettie.